Until recently, felt-tipped or porous-tipped marker pens (often simply called "fineliners") were never something I had considered using on a day-to-day basis. It wasn't until I had read the Pen Addict's reviews of the Sakura Pigma Micron--a pen I had never tried--that I picked up some marker pens on a business trip to New York City at the inimitable DaVinci Artist Supply. This first lot included a Micron in a .3mm tip (the "02" model), a Copic Multiliner in a .35mm tip, and a pack of the "Fine" Sharpie pens. I use all of these pens, and plan to post a thorough review of each of them in due time, but neither of these initial purchases really did it for me in terms of an everyday writer. They work great for jotting notes and doodling--and the Micron is the Field Notes Pen if you want dark black ink and absolutely no bleed through--but the Micron's tip felt a little fragile for heavy use, and I found the inks in the Copic and the Sharpies not quite dark and wet enough for my preference. Enter Pilot. I'm a longtime user of Pilot pens, and as I mentioned in an earlier post, the Pilot Precise Liquid Ink Pen was the first pen I ever purchased by the box, way back when I was in school. 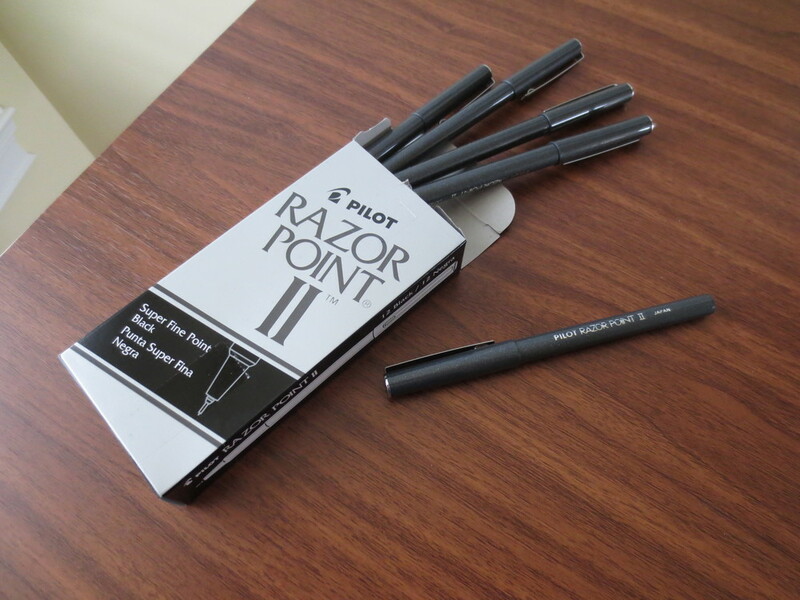 Pilot has excellent dark black ink, even in its disposable pens. (If, like me, you can handle a bit of bleedthrough on super-cheap papers, a black Pilot pen might meet all of your black-ink needs.) On a whim, I picked up a four-pack of Pilot V Razor "Extra Fine" Marker Pens. Too broad. They wrote that great dark black line, but the width didn't allow me to do the type of tiny note-taking and annotation that I need to do at work. 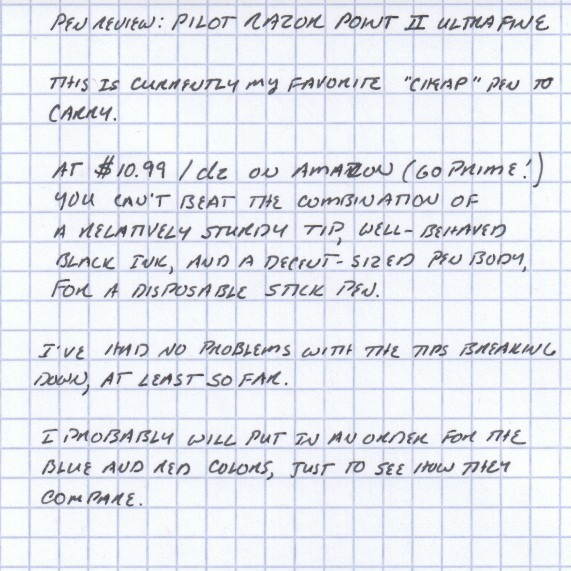 So I went online to see if Pilot made an even finer version of the pen, and I found these, at 10.99 for a dozen, on Amazon. At 10.99/dz, you certainly can't beat the price. After using this pen nearly exclusively for a week, I can safely say that this is a great fineliner. There has been no breakdown in the tip, from what I can tell, and the inkflow has remained consistent. That said, there is some (I would say minimal) bleedthrough with the ink. This is a true fineliner, intended for writing, so the ink is not super-precise and well-behaved like you would find in a technical drawing pen such as the Pigma Micron or the Copic Multiliner. What you lose in ink properties you gain in durability, and any issues with the ink still has not stopped me from using this pen on both sides of the page in a Field Notes notebook. I would say the bleedthrough is less than you would experience with any sort of fountain pen or rollerball. This is the tip after two-weeks of heavy use. Minimal, if any, breakdown, and the pen is still going strong. I suspect that if I had used fineliners prior to using fountain pens, tip durability might be an issue, but for fountain pen users who are accustomed to writing with less pressure, durability is less of a concern. If you are looking for a purchase that will run you approximately $.92 / pen, IMHO the Razor Point II can't be beat. You can find a Micron in the $2-3 range (for a single pen), but to me, who is more or less a cheapskate, that still stings a bit if/when you lose it, or when the tip breaks down when the pen is only half empty. I'm pretty sure I've already misplaced one of the Pilot V Razors (if it didn't "walk" of my desk at work when I was out of town last week), and even that is eating at me. Don't laugh, I know I have problems.